I declare a beard war. Click on the links, view their auctions, peruse their poses and then vote for your favorite below – poll closes on Friday September 26. 1. The model for drewkirk is sporting half-stache-soul-patch growth. 2. The model for princesvintage goes with the classic 5 o’clock shadow, or what ever time that is over in the UK. 3. 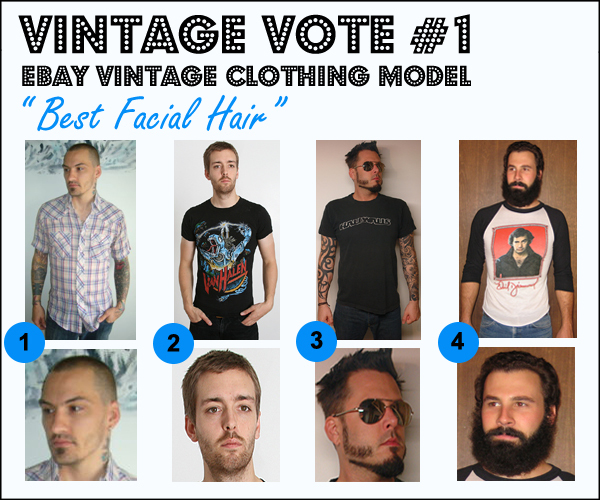 The model for vintage_lovers gets creative with his clippers, tailored side burns, soul patch goatee fusion. 4. The model for americanarchive is a big fan of Santa Claus, Grizzly Adams and Just For Men.